Boxgrove Priory, founded by Robert de Haig of Halnaker and dedicated to S. Mary arid S. Blaise, has sprung from a tiny beginning to a church that is only second to Chichester Cathedral among the churches of Sussex. 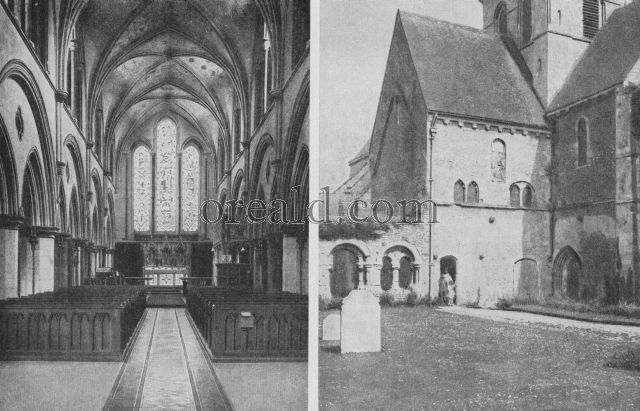 Originally it was a retreat for three monks migrating from the Benedictine House of Lessay in Normandy ; the numbers steadily rose and the accommodation increased until in the reign of Henry V it was recognized as an English priory and parish church. The central tower (Transitional) is not only striking but typical, as to its head, of Sussex churches of the period. The features of the interior (left) arc the very graceful shaftings of Purbeck marble, the subdivision of the arches, and the unique wooden galleries in. the transepts.